Food Hunter's Guide to Cuisine: Who's Your Pizza Maker! My husband is the pizza maker in our family. He's been making his own pizza for the past 6 years. He uses the same dough (from Niccoli's), the same amount of cheese (1 1/2 fresh mozzarella balls) and the same canned tomato (La Valle) and we get a delicious pizza every time. So when he was out of town last month I decided to try my hand at pizza making. There was some extra dough (enough for a personal pizza) leftover from the last pie my husband made and a small amount of mozzarella cheese from a caprese I had made early that week. Since there wasn't enough mozzarella to cover the whole pie I decided to use feta cheese on the other half. 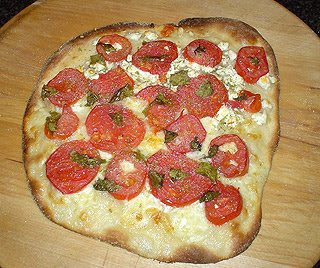 I topped the cheese with thinly sliced tomato from our garden and sprinkled it all with fresh basil and dried oregano. (for some reason dried oregano is much better than fresh) I popped the pie into the oven for about 12 minutes at 450 degrees and viola!... Not the traditional pizza my husband makes but it was still delicious in it's own way.